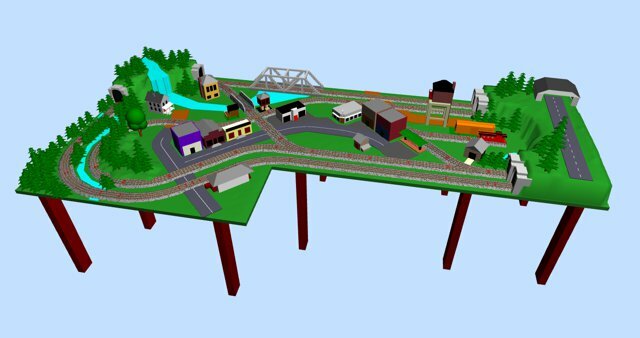 This is the new, expanded version of the Lucasville train layout in O scale, which now has redesigned left side with tunnel, waterfall and one more reverse loop, connecting the two ovals. ﻿One short YouTube video featuring two steam engines with sound and smoke genertors, running on the both lines and with all layout lights turned on can be seen here: Some progress on the layout. Check also the original Lucasville O-gauge Train Layout to see what is changed in the new, expanded version and read the Eric's topic The Mayor of Lucasville has approved the railroad expansion in ModelTrainForum.com in order to follow the reconstruction progress.